The latest report by the U.S. Commission on International Religious Freedom says religious freedom across the world deteriorated in 2015. Purple indicates high religious persecution and red, medium religious persecution in a 2014 report on religious freedom. Among countries listed in that category are Iran, Iraq, Tajikistan, Turkmenistan, Pakistan, and Uzbekistan. 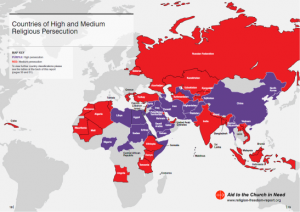 Afghanistan, Azerbaijan, Kazakhstan, and Russia were among 10 countries categorized as “Tier Two,” meaning religious-freedom violations in those countries are serious enough to require close monitoring.